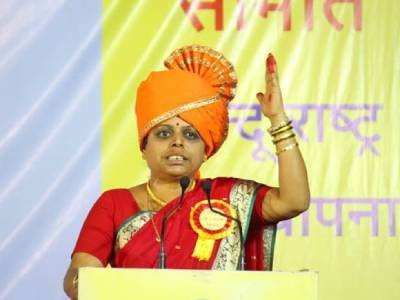 Solapur : On 6th February, ‘Hindu Rashtra-jagruti Sabha’ was held at Jai Bhavani Prashala’s ground which was addressed by MLA T Rajasingh from Bhagyanagar, Shri. 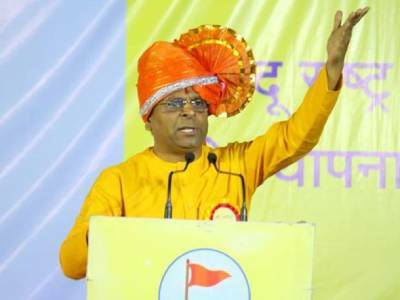 Manoj Khadye, State Coordinator of Hindu Janajagruti Samiti (HJS) for western Maharashtra, Konkan and Gujarat and Sadguru (Kum) Swati Khadye, ‘Dharmaprasarak’ of Sanatan Sanstha with their brilliant speeches. The ‘sabha’ was attended by 20,000 Hindus. Office bearers of various political parties, their members, office bearers and activists of pro-Hindu organizations; besides devout Hindus from nearby villages were present. Shri. Ajay Shrichippa blew conch in the beginning; followed with lighting of lamp by Sadguru (Kum.) Swati Khadye, ‘Dharmaprasarak’ of Sanatan Sanstha and other dignitaries. MLA T Rajasingh garlaneded the statue of Chhatrapati Shivaji Maharaj. ‘Purohits’ viz. Shri. Venugopal Jilla, Shri. Nagraj Raskonda, Shri. Bhanuchandra Chippa, Shri. Shriniwas Jilla and Shri. Vyankatesh Shrimal recited ‘Veda-mantras’. The ‘sabha’ was compereed by Shri. Vipul Bhopale and advocate Nilesh Sangolkar of Hindu Vidhidnya Parishad (HVP) who also offered thanks while concluding the meeting. MLA T Rajasingh reaches venue of the ‘sabha’ in huge procession, amidst background of drums ! Huge procession was taken out by Shriram-devotees with MLA T Rajasingh which was joined by young devout Hindus in large number. Many of them wearing saffron caps and slogans were raised on the occasion. Many devout Hindu youth carried saffron flags to the venue of the ‘sabha’. They raised slogans of ‘Jayatu Jayatu Hindu Rashtram’, ‘Jai Shriram’, ‘Jai Jai Shivaji-Jai Jai Bhavani’, ‘Har Har Mahadev’. Few devout Hindu youth came to the venue playing ‘halgi’. Several young men were coming to the ‘sabha’ in groups. Devout Hindu young men also came from nearby lanes carrying saffron flags. Young men from ‘Padmashali Samaj’ came to the venue wearing yellow clothes. Hindus are facing several problems these days like ‘love jihad’, ‘land jihad’, conversions, killings of pro-Hindu leaders and Saints etc. In rural areas like Solapur also incidents of love jihad and conversions have been reported. Police administration scares only Hindus that they should follow various laws. They demolish unauthorized temples but do not even touch unauthorized religious places of non-Hindus. The local administration takes no action even after submitting list of such unauthorized religious places. Fanatics are involved in ‘land jihad’ as they are grabbing government lands and taking them under control. 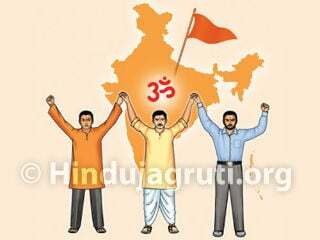 First remember that ‘I am a Hindu’ and take active part in the mission of establishing Hindu Rashtra by sacrificing mind, body and money. 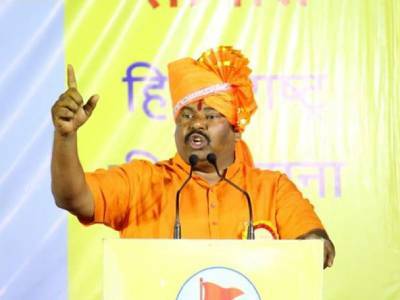 The above appeal was made by MLA T. Rajasingh, MLA and Founder of ‘Shriram Yuva Sena’ while addressing ‘Hindu Rashtra-jagruti Sabha’ held at Jai Bhavani Prashala’s ground. Posters and hoardings of cruel Tipu Sultan are displayed in Solapur city. In neighbouring State Karnataka, ‘Tipu’ is treated as a hero. In Maharashtra, posters of only Chhatrapati Shivaji Maharaj should be displayed; therefore, give apt reply to those putting up ‘Tipu’s posters. Fanataics say that it is our country. If this was their country, why was Ram-Mandir demolished in this country ? Today, there is talk about building of mosques; but if at all mosque is to be built, build it for patriotic leaders like Abdul Kalam. Shiv Sena Chief Balasaheb Thackeray was a very resolute person. He was proud of Hindu Dharma and same attitude should be nurtured by Hindus. 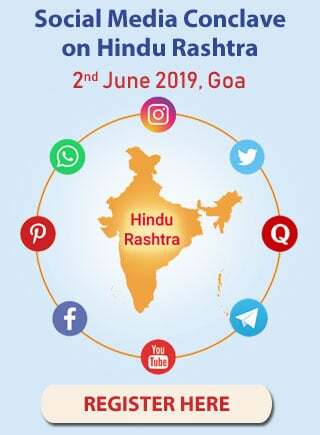 Hindus if interested in joining special activities related to protection of Dharma, they can contact activists of HJS in their area. Today, Government is arresting Hindus’ leaders. Activists of HJS are arrested. Police have granted permission for this ‘sabha’ only till 8.30 p.m. In fact, there will be guidance on Hindus’ welfare but where there are restrictions on talking about Hindus’ welfare, can this be called as Hindu Rashtra ? Investigating agencies have fabricated a story that ‘Kshatradharma Sadhana’, a book published by Sanatan Sanstha was read by the persons who were inspired to join the mission of Hindu Rashtra and they formed a terrorists’ gang of like-minded people. These investigating agencies should also tell us which books were read by armed naxalites involved in anti-national activities; or by jihadi terrorists; by fanatics raising slogans of ‘Bharat tere tukade honge, Insha Allah, Insha Allah!’ and pelting stones at our army; by ‘love jihadis’ who deceive Hindu girls, molest them and convert them. 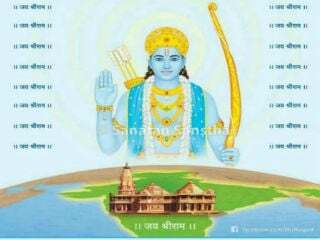 Contribution of every person is important for Hindu Dharma and for reviving past glory of this country. God’s grace can be acquired by undertaking spiritual practice and ‘Dharmacharan’. It also helps to acquire Saints’ blessings. 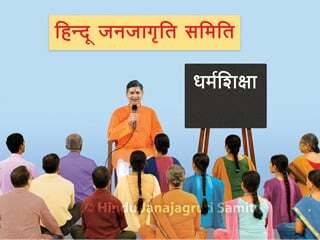 Power of Hindu Dharma is in ‘sadhana’; therefore, every Hindu must undertake spiritual practice. Guidance by Sadguru (Kum) Swati Khadye, which was full of love and respect for Dharma, drew applause for every example given by her and won hearts of participants ! Guidance given by Sadguru (Kum) Swati Khadye was filled with love and respect for Dharma. 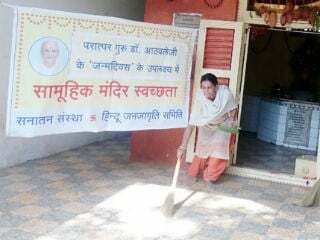 Her guidance won over hearts of all devout Hindus attending the ‘sabha’. Many statements made by her drew applause from participating devout Hindus. Guidance by Sadguru (Kum) Swati Khadye took this ‘sabha’ to much higher level. Sambhaji Brigade’s Shrimant Kokate opposed to install sculpture of Chhatrapati Shivaji Maharaj and Samartha Ramdas swami at the entrance gate of JNPT in Mumbai and he warned of staging agitation. Such opposition shows richness only in name but paucity in thoughts. Recently, a District President of ‘Brigade’ was nabbed in a case of demanding ransom money. Such ransom-extractors have no right to even utter the names of Chhatrrapati Shivaji Maharaj and Chhatrapati Sambhaji Maharaj. 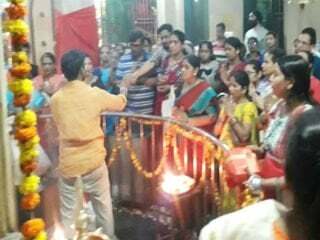 In the coming period, ‘Gudhi Padva’ will be celebrated with right acts as prescribed under Hindu Dharma and not under anti-Hindu propaganda of these ‘Brigadi’ people. Hindus, however, know who is the so-called ‘Jaantaa Raja’ supporting these ‘Brigadis’. Hindus attending the ‘sabha’ in such large number, are not the people hired by politicians but are the ‘mawlas’ of Chhatrapati Shivaji Maharaj. 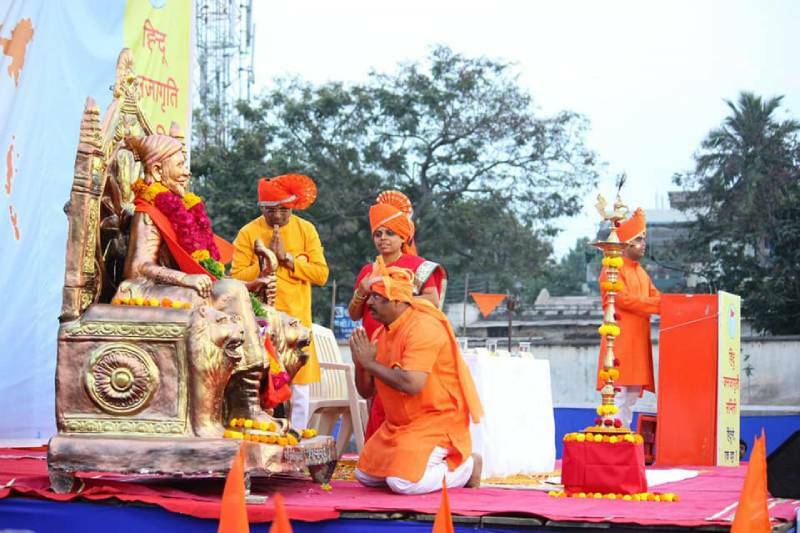 Messages of arrests of 4 HJS activists were sent to scare Hindus from attending the ‘sabha’. The ‘sabha’ was held successfully despite such false propaganda. It shows that Hindus are now coming together ! Police had issued notice to HJS activists under section 149 in the background of this ‘sabha’ though they are working in lawful manner for creating awareness. When are these police going to take action against persons distributing Bible copies in schools and making schools as haunts of conversions? Police need to remember that in forthcoming period of crisis, only Hindus will protect them. Congress demanded to stop ‘sabhas’ proposed to be held by HJS at Shivmogga and Mangaluru in Karnataka State; though only welfare of nation and Dharma is talked about from HJS platforms; therefore, Hindus should make demand for imposition of ban on Congress party which was responsible for massacre of Sikhs and is celebrating Tipu’s birth anniversary. 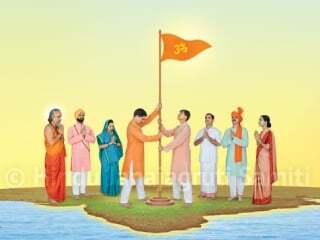 Oath of establishing Hindu Rashtra kindles patriotism among participants ! ‘Sabha’ was ended with taking of oath for establishing Hindu Rashtra and it kindled patriotism in participating devout Hindus. Shri. Vijaykumar Deshmukh, the guardian Minister also took the oath with feelings ! Historical ‘sabha’ receives 2000 people’s feedback ! More than 2000 devout Hindus attending the ‘sabha’ have given their feedback. Many of them have shown readiness in joining HJS activities and in organizing similar ‘sabha’ in their areas. They showed interest in participating in every drive undertaken by HJS ! The ‘sabha’ was shown through ‘Facebook live’ and spread to more than one lakh people. 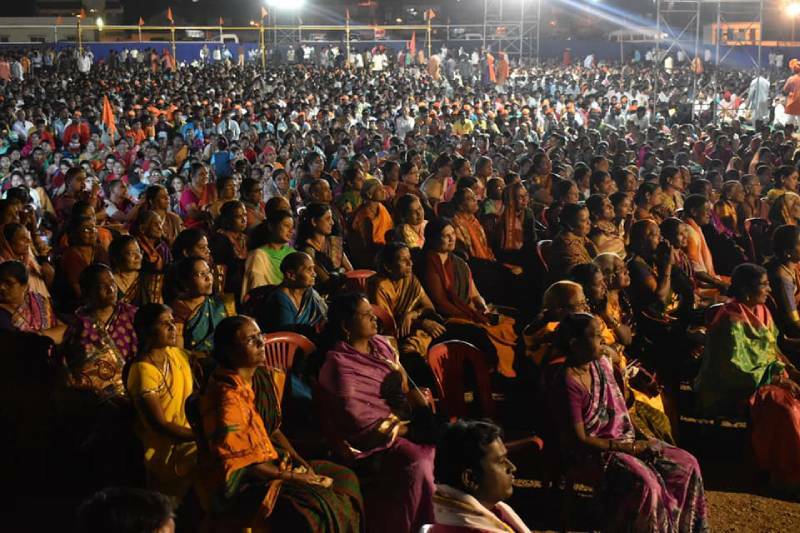 Meeting held after the ‘sabha’ was attended by 1500 devout Hindus ! Meeting held after the ‘sabha’ was attended by 1500 devout Hindus. Hindus have been divided in different castes. They are fighting amongst each other for trivial reasons. One, who fights for Hindus, is a true patriot; therefore, Hindus should come together only as Hindus; leaving aside their castes. We take out a huge procession at Bhagyanagar on the day of Shriram Navami. You too take out such processions in every city ! Goddess Pārvatī in a specific form.